Voyager's Quest Video Slot Review - Casino Answers! Voyager’s Quest is a 5-reel, 20-line video slot developed by Top Game, featuring a wild symbol, a free spins feature and a bonus game. You can play the Voyager’s Quest video slot at Bovada. Voyager’s Quest is a penny slot. Bets on the Voyager’s Quest slot machine are $0.01, $0.05, $0.10, $0.25, $0.50, $1, $3 and $5 per line. You can select up to 20 paylines on the Voyager’s Quest slot game. The maximum total bet on the Voyager’s Quest online slot is $100 per spin. The Voyager’s Quest video slot has a good betting range for online casino players. 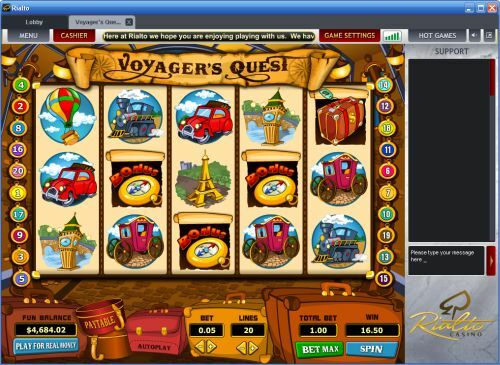 To play the Voyager’s Quest casino game, select your bet and press the “Spin” button. To spin the reels with all 20 paylines active, press the “Bet Max” button instead. The Airplane symbol is the top-paying symbol on Voyager’s Quest. If you land 5 Airplane symbols on an active payline, you will win the 9000 coin top jackpot. Airplane symbols are wild and will substitute for all symbols except for the scatter and bonus symbols. Other high paying symbols on the Voyager’s Quest video slot include the Leaning Tower of Pisa (2500 coins) and Big Ben (1500 coins). The scatter symbol is the Suitcase. 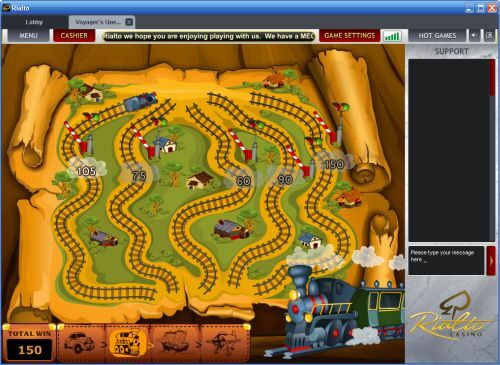 If Suitcase symbols appear on reels 1 and 5, you will win 5 free spins. This free spins feature is triggered frequently, so you can use it to win lots of free cash wins when you play at Bovada. Only the highest win is paid on each selected payline. All symbols pay left to right. Scatters pay on any position. All wins are multiplied by the bet per line. Free spins feature and bonus wins are paid in addition to payline wins. The Voyager’s Quest slot machine has a basic autoplay mode. You can use the “+” and “-” buttons to select anywhere from 5 to 95 autoplay spins (in increments of 5). To stop the autoplay mode at any time, press the “Stop” button. Voyager’s Quest is a very solid travel-themed slot game. It has free spins, a very good top payout, a bonus game and lots more! You can play the Voyager’s Quest video slot by signing up and downloading Bovada! Where can players from the United States play the Voyager’s Quest online slot? If you are located in the USA, you can play the Voyager’s Quest video slot for free or real money at Bovada. Do I need to download any software to play the Voyager’s Quest slot game? Yes, in order to play the Lucky Number fruit machine, you must download the casino software from Bovada. There currently is no Lucky Number flash game available to play at press time.